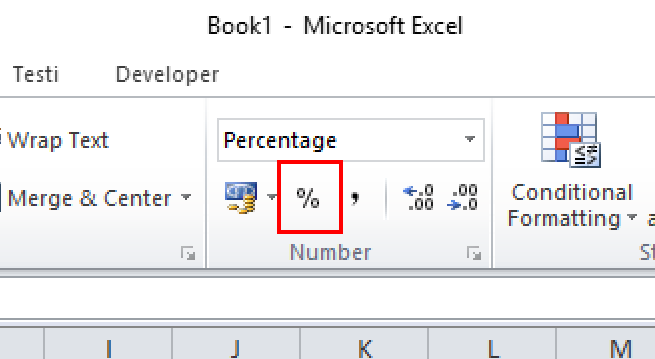 This is a Microsoft Excel training tutorial on how to calculate percentage in any version of Excel. Learn three cases you can use in all situations and know how to calculate percentages correctly in Excel. Example one: how many percentage is X of Y? Here's a simple example: the original price of a product is 149 € and it is now being sold at 79 €. How many percentage is 79 € from 149 €? You can get this easy with new price/old price. This will give us 0,53. Change the formatting of the cell to percentage (in the home tab, under data click the % mark) and you get 53%. Example two: how much is X% of Y? The original price of a product is 159 € and it is now sold with discount of 25 %. How much is the discount? You can get this again easy with price multiplied with discount percentage. This will give us 39,75. Note that we don't have to divide the 25 % with 100 when the value is formatted as percentage because the real value in the cell is already 0,25. So how much is the discount price? 159 € - 39,75 € is 119,25 €, so the discount price would be roughly about 120 €. The most important thing here is to note that you cannot calculate VAT correctly by multiplying the price with the VAT percentage (in case you are wondering, this has actually nothing to do with Excel, it's just math). Let's see an example how to use the formula. A product costs 15,09 € and the price includes VAT of 21 %, how much is the VAT? This will give us 2,62 € and we can now quickly calculate that the price without VAT is 15,09 € - 2,62 € = 12,47 €. That's it for this tutorial, you learn more of Excel in our Excel courses. The Excel Essentials training course is perfect for for beginners and intermediate levels, the Excel Advanced course is the best match for those who want to become more advanced Excel users. Wondering how to remove the first word in of a text Excel? Or how to remove the first words dynamically in Excel, if the length of the words varies? No problem! You can achieve both pretty easily if you understand the functions RIGHT, LEN and SEARCH.